Sowing seeds or raising young plants this spring? The latest Which? tests show that the quality of composts can vary hugely, so be sure to choose a Which? Best Buy to get your plants off to the best start. Every year, Which? tests composts for sowing seeds and growing on young plants and, every year, they vary significantly. 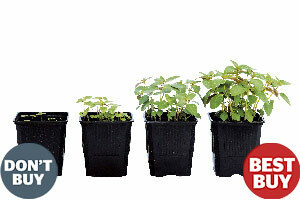 As the picture on the right clearly shows, the worst composts produce weak, small plants, whereas Best Buy composts produce plants that are large and healthy. Which? tested 13 peat-based and seven peat-free composts, all described as multipurpose or suitable for seed sowing. The compost brands on test included products from Westland, J Arthur Bower’s, New Horizon, B&Q and Homebase. The trial results revealed two Best Buys: one multipurpose compost and one specifically formulated for seeds and cuttings. There’s also a Recommended peat-free compost for people who prefer not to use peat. Even within brands, the testing team found big differences in quality. The two brands that produced Best Buys also offer products that performed less well in the Which? trials. One brand produced a Best Buy and a Don’t Buy. Growing plants in pots? Look out for the results of our container composts trial in mid-February 2012.